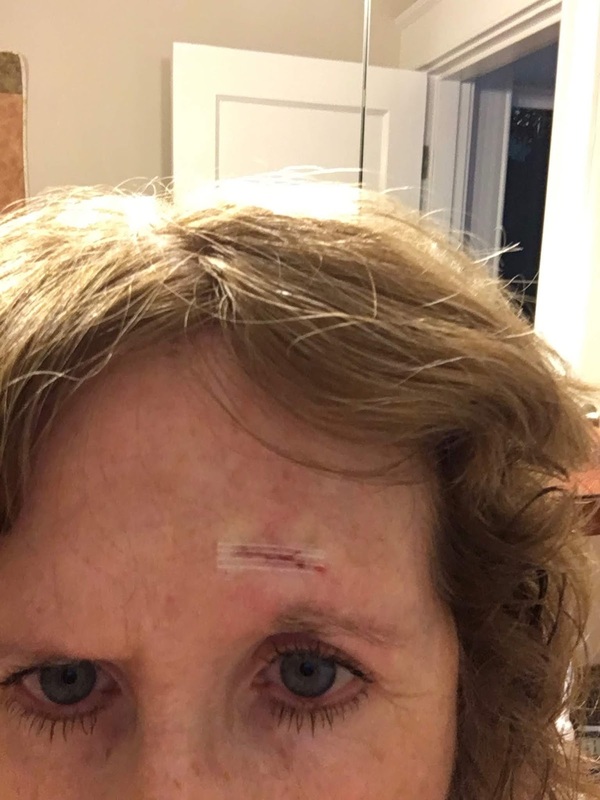 To add to the list of medical procedures I'm having done this week, yesterday I went to my plastic surgeon to have yet another suspicious spot removed from my forehead. It's one we have been watching for a bit, but as it has not responded to liquid nitrogen (it should blister and then peel, but it does nothing), the dermatologist said to was time to have it removed. In checking my records I realized that I had not been to the plastic surgeon since September of 2016, so that actually is not too bad for me. Unfortunately this is my 14th skin cancer, if indeed the biopsy comes back positive. I have resigned myself to the fact that this is my life from now on, but I have been taking extra precautions with my skin so hopefully I won't have too many more that will need to be surgically removed. I did not sleep well last night as the doctor told me to keep my head elevated to lesson the risk of bleeding. It hurts today, but not as much as yesterday. It should feel much better by tomorrow, which is good because I am volunteering at the Michelob Ultra Pickleball Tournament in the morning. It was supposed to be outside at Forest Park, but because rain from the hurricane is headed our way, it has been moved indoors. Unfortunately that means a 45 minute drive for me in the morning, and I have to be there by 7:00 a.m. It is the first sanctioned tournament to be held in St. Louis, so I am eager to see the 4.0 and 5.0 players in action once my volunteer work is finished. On a more fun note, last weekend was Paint Louis 2018. 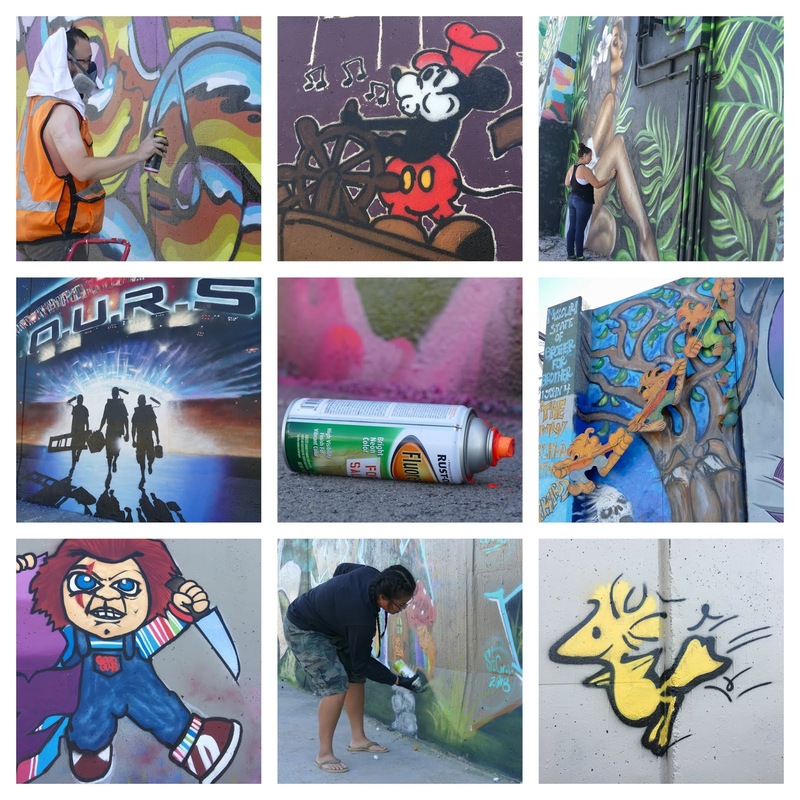 This was an organized event allowing graffiti artists to legally spray paint the flood wall that runs along the Mississippi River in downtown St. Louis. Hundreds of artists came from mostly around the Midwest, with live hip hop music adding to the party atmosphere. By the time we got down there Monday morning, most of the artists had packed up and left. But there were a few remaining, and it was interesting to talk to them about their work and the process they use in creating art to cover such a large space. 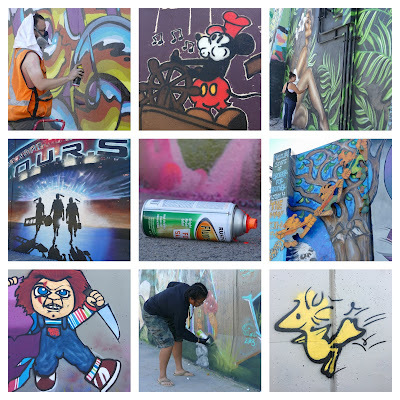 Sadly, it won't last for long as other graffiti artists will come along and paint over what is already there. It is a constantly evolving work of art.